The following instructions are on how to tint flat glass windows only. For automotive tinting instructions, videos are typically recommended because the procedure is trickier. Here you can find out how to tint automotive windows. Cutting Knife (A) or other utility knife for cutting and trimming film during installation. Single-Edge Razor Blade (B) used during cleaning to remove small (pieces of tape and/or stickers. Scrubbing Pad (F) used in place of blades for safer cleaning of glass. 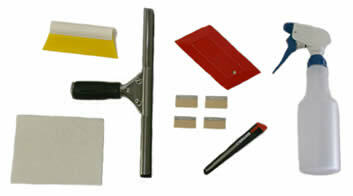 Rubber Squeegee (C) for cleaning glass surface and to squeegee (mounting solution out from beneath film. Hard Card (D) to use as a trim guide for cutting film edges during (installation. Can be wrapped with paper towels to use as a hand (squeegee for cleaning and preparing glass. 16-oz Spray Bottle (E) for mixing and applying mounting solution. Lint-Free Paper Towels (not included in tool kit) for cleaning glass surface and absorption of excess mounting solution. Mild baby shampoo (not included in tool kit) for mixture with water for mounting solution. Mix 4 drops baby shampoo into 16 ounces of water. (Tip: If the water in your area is hard, you may want to use distilled water. Note: The use of baby shampoo serves two purposes. It acts as a lubricant when positioning film during installation and it prevents the film from sticking to itself. Pour solution into a spray bottle for ease of use during installation. Note: The mounting solution will be used for several purposes during film installation: cleaning and preparation of glass; wetting adhesive for ease of positioning, cleaning of film surface during and after installation. Glass must be perfectly clean. Remove any tape, stickers, paint or stain using a single-edge razor blade. Tip: Wetting the glass with the mounting solution will reduce the chance of scratching the surface during the scraping process. Use a fresh blade for each job or be sure to check blade for imperfections which may cause scratching. Once glass has been cleaned of debris, use the razor blade to go over glass one more time to remove any leftover residue. Spray glass once more and squeegee it dry using the Rubber Squeegee (B), then wipe edges dry with lint-free paper towels. Measure height and width of glass surface, keeping in mind the roll width of the pattern youre working with. It may be necessary to splice together two or more pieces of film in order to cover your surface. Carefully remove required film from kit. If using roll film, use a knife and trim guide to cut. Tip: We allow approximately 1 extra material on each side of the film when cutting. Remove protective liner from back side of film. Begin in one corner and peel away to expose adhesive. Tip: If you have difficulty doing this, take two pieces of clear adhesive tape, apply to one corner of each side of film and peel apart. Thoroughly saturate the adhesive by spraying with mounting solution. This process will allow for easy positioning of film onto your surface. If any area of adhesive is left dry, it will grab onto the surface and cause difficulty when positioning. Avoid this by misting the surface of the glass with mounting solution. Carefully place film onto surface (adhesive side to glass surface) and position as desired. Once you are satisfied with the film position, you will begin to squeegee out the excess solution. For this first squeegee process, begin by spraying the film surface with mounting solution. Using moderate pressure, take the rubber squeegee and work from the center out to the edges of the film. Using the trim guide and knife, trim excess film from edges of surface. Tip: It is best to cut in one continuous movement, using the trim guide to keep film firmly in place. Spray film surface again with mounting solution. You will now begin the second squeegee process using the rubber squeegee. All remaining solution must be pushed out from behind the film. You will need to apply more pressure during this step. Tip: For this squeegee process, you may use a rubber squeegee and we recommend you catch excess solution from edges with a paper towel. This will prevent the solution from seeping back under the film. Another option is to wrap your trim guide hard card with a paper towel and use it as a squeegee. PLEASE NOTE: Should you feel your tool begin to drag on the surface, lightly mist it with mounting solution. If any bubbles are not removed after step 8, it may be necessary to squeegee again. Always lubricate the top side of the film with the mounting solution before applying the squeegee.